Change is faster and more present today than ever before in our culture. Whether it is business, technology, organizational thinking, globalization, we are faced with more change today than ever before in our history. So, why is courage important in leadership? 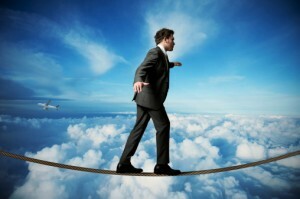 In the face of so much change, leaders are often on a short leash or timeframe, walking a tightrope to navigate an organization including the key executives through that change successfully. That takes courage as it is your head that is on the block! While preparing this article on the subject of courage, I am reminded of the value of an empathy map. Empathy maps bring forward a perspective of our senses that we could otherwise miss. Visually, they help us understand that, more than just speaking, listening and seeing are present in communication. Being prepared to use our full cadre of sensitivities (e.g., thought, emotions, and the heart), with feelings and care, as well as recognizing the body language of those with whom we are engaged, sounds like a tall order. When faced with any sensitive issue or potential conflict, it is valuable to understand that the person(s) with whom we are communicating come with a full spectrum of interactions. To say the least, there is a lot going on when we meet with colleague(s) to discuss any change in how a business functions. These reactions can easily become intensified in times of stress, particularly if the news of change is considered bad by some. I gain much useful information when coaching on strategic issues that touch on the challenge with which my coachee is dealing. As an integral part of the corporate coaching process, I purposefully probe my client’s ideas on a topic. My facilitation is a search for solutions, which I expect to bubble up along with a potential action plan. My probing helps unearth all components of the situation (e.g., its nature, the implications, and the short- and long-term range). Many times, forward movement is restricted by a person’s reluctance to take action, especially if the consequences impact others. Say, for instance, that my coachee’s actions are likely to affect the economic well-being of an employee. Proceeding with such a change and knowing that the results will affect that person negatively can be difficult. An overarching reality for any business owner who grapples with hard decisions is that the business has little value to those who rely on it—either for their livelihood or as a supplier of goods and services—if it does not remain viable and stay in business. Each step in the coaching process helps a coachee build the courage needed to be effective and decisive in their actions. As they converge on a solution, I have found that, when my coachees use their self-empowerment, they clear the roadblocks that have been impeding success. Thus, their organization can move on and achieve higher levels of accomplishment. We have only highlighted some of the doubts (that can creep in) and reasons in answer to the question of: Why is courage important in leadership?. Entire books have been written on the subject. It takes a combination of audacity, humility, faith and conviction to exercise courage and lead an organization through the ups and downs of a business or organizations development.